Navy Adm, Kurt W. Tidd, commander of U.S. Southern Command, visited Colombia Feb 9 – 10 to discuss security cooperation with the nation’s top leaders and get a firsthand look at Colombia’s peace-building and security efforts. “I want to underscore our commitment to deepening our longstanding partnership with the Colombian Armed Forces and National Police in support of security and stability across our hemisphere and around the globe,” Tidd said at a press briefing in Tumaco. 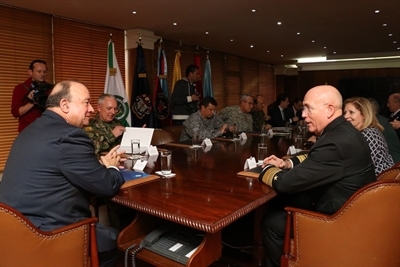 “Our Armed Forces have stood alongside each other for decades and we continue to play a role in U.S. assistance to the Colombian people as they embrace the opportunities of the post-accord era,” Tidd said.